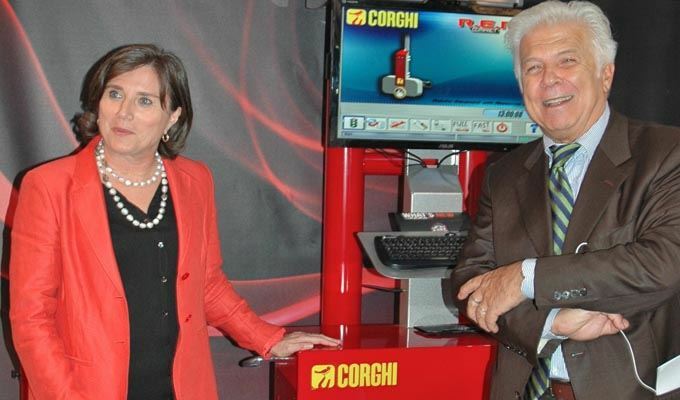 Cinzia Corghi and Mauro Severi of Corghi pictured here on the company stand at Automechanika 2014. On display was the latest version of the R.E.M.O. touchless and robotic aligner. Danilo Nava took the time to demonstrate the newest feature of the system, which eliminates the last manual process of steering adjustment. The robotic steering system communicates automatically with the rest of the R.E.M.O. unit to execute the alignment diagnosis. Also on the stand was an example of the compact van setup aimed at servicing the growing direct order tyre customer, who generally order their tyres online but need professional fitment. “The system has been compacted as much as possible to allow the vehicle to enter standard parking areas to perform the fitment” Nava explained. Corghi is distributed in SA via Wheelquip.